Our Naperville and Oswego Farmstands will reopen next week! Naperville Farmstand opens Wednesday, April 24th and Oswego Farmstand opens Friday, April 26th. 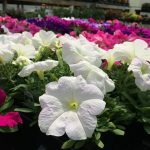 We sell annuals, perennials, hanging baskets, mixed planters, succulents, vegetable & herb plants, and MORE! It has been a long winter. Stop in to experience SPRING! Marty, Neil, and Nik placed our hanging baskets on the hooks to free up some much-needed floor space. We still have planting to do, and the greenhouse is filling up quickly. Our Naperville Farmstand and Oswego Farmstand will open in two weeks! See you soon!